Combining superior technologies with industrial design, Cycliq’s range of all-in-one HD camera and safety lights is a cycling advancement. The bright 400 lumen LED light brightens the darkest of trails. It will illuminate an extra-long pathway and ensure other road users will see you in day light as well as at night. The cone-shape beam enables you to mount Fly12 both above or below the handlebars. Multiple brightness levels and light mode settings, including solid on, pulse and flash can be configured and remembered for your next ride. Fly12 records in crisp full HD. The high-quality wide-angle lens can capture everything around you in clear detail. Various frame rate and resolution settings can be configured through the CyliqPlus app. Fly12 is the only camera/light combination on the market to last up to 10 hours in camera mode. 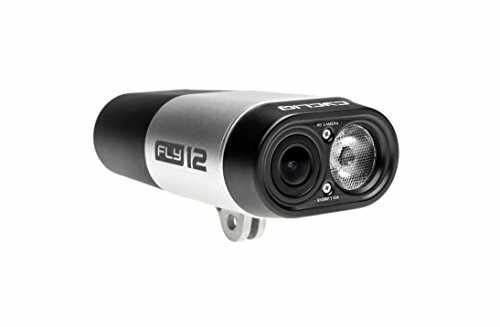 With Fly12’s looping video technology, the camera records in a continuous loop. When the memory card is full, the unit will begin overwriting older footage. Don’t worry! You can lock away any special recording you wish to keep while riding with the simple press of a button. Turn Fly12 into a bike alarm. When the unit is moved, the alarm will sound, begin to flash and record. You will also receive an alert notification on your smartphone. In the event of an incident, or your bike falls over, Fly12 will safely store your footage should you not be able to reach your unit. With our world-first safe passing distance guides, you can assess whether motorists are abiding by safe passing distance legislation. Using nanotechnology, Fly12 is made weather resistant. On a nano-level, a hydrophobic coating protects both the inside and outside from corrosion. Add STRAVA metrics to your ride footage such as speed, heart rate, wattage, cadence and gradient with the CycliqPlus app. Upload your STRAVA overlay ride footage to social media, or share it with your friends. Includes a bonus 3 month STRAVA Premium. If you have any questions about this product by Cycliq, contact us by completing and submitting the form below. If you are looking for a specif part number, please include it with your message.